Download a FREE version of Head Over Heels for your PC, MAC or Linux. It's freeware and completely safe, and it ran brilliantly on my own PC using Windows. When you run the game simply use your arrow keys to select options within the game and the ESC key to exit the game. This stunning arcade adventure game was first released in 1987 for the 8-bit home computers Amstrad CPC, Atari XL/XE, C64 , ZX Spectrum and MSX, but was later ported to the Amstrad PCW, Atari ST and Amiga. The first video clip features the Amstrad PCW 8256 version. The video is a bit wobbly, but you get an idea of what it was like to play the game on a green screen monitor - remember them? What was particularly novel about the game was the fact that you had to control two characters, Head and Heels. Head had great jumping abilities and control in the air, and could fire doughnuts at this enemies. Heel was a faster runner and could climb areas that Heel couldn't. 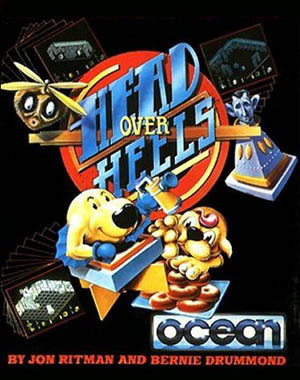 Released by Ocean Software, the game received rave reviews with most computer magazine reviewers awarding 9/10 or over 95%. 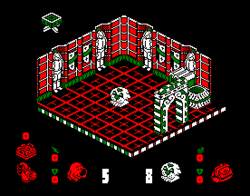 The isometric puzzle game was programmed by Jon Ritman, and he was particularly good at creating games for the Amstrad CPC and ZX Spectrum. He first programmed games for the Sinclair ZX81, but went on to create games for Ocean Software including Batman and Match Day II. 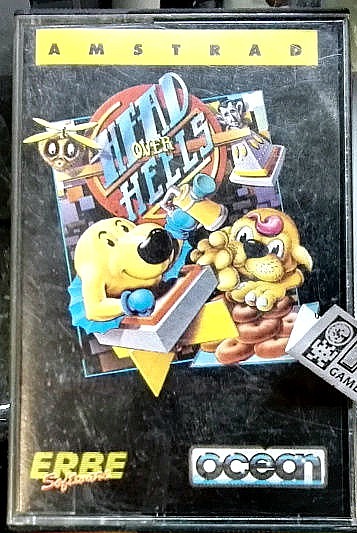 I played the game on an Atari 800XL in the 80s, and although it took me a while to get used to the controls due to the 3D perspective of the game - I also had similar problems with Q*Bert - once you've got the hang of them there is plenty of addictive fun to be had. This long clip features some of the tape-loading sequence, if you're into that kind of thing! The Speccy game looks really decent and the 3D isometric graphics must have proved challenging to program on the machine. You will note that only one colour is used for each room, with all of the characters also changing to the same colour. Nonetheless, the game received 9/10 from Your Sinclair magazine in June 1987, with Crash! awarding 97%. Here is an interesting walkthrough of the Commodore 64 version which features unrehearsed commentary by the video uploader Steve Benway. He is playing the game for the first time so he is quite bad at it, but this makes it interesting to watch, and it reminds me of when I first played the game back in the eighties!